Actual weight is the weight of the package according to a weighing scale. It is a contract between the shipper and the carrier specifying the terms and limitations of liability in which the air carrier agrees to transport the goods. Select this option to bill the Air21 account assigned to a party other than the Shipper or Consignee. A valid 9-digit Third Party Air21 account number must be entered for transportation charges. Select this option to bill the Air21 account assigned to the Consignee. A valid 9-digit Consignee Air21 account number must be entered for transportation charges. 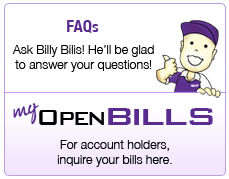 Select this option to bill the Air21 account assigned to the Shipper. A valid, 9-digit shipper Air21 account number must be entered for transportation charges. Shipments weighing 300kg and above, or uses 50 or more airwaybills. The weight used to compute freight charges. May be the actual or dimensional weight, whichever is higher. It provides durable wood-structured containers for highly fragile shipments such as glass, ceramics, etc. Description of Item/s being shipped. A person or a company who receives the package. 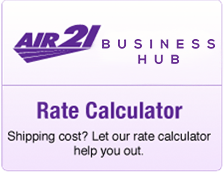 The latest time that a shipment can be accepted by Air21 for shipment for that business day. It is the assigned final arrival point of the shipment. The declared value is the selling price or replacement cost of contents inside the package. It is used to compute for Declared Value Surcharge. One percent (1%) of the shipment’s Declared Value. Is a calculation of the shipment's weight based on its volume instead of the actual weight. Dimensional weight is calculated by multiplying the length by height and by width of each package in centimeters, and divided by 3500. The Air21 courier picks-up the cargo right at the shipper's doorstep and delivers it at the consignee's doorstep as well. A shipment can be held for customer collection/pick-up at any Air21/Mail and More location at the port of destination. 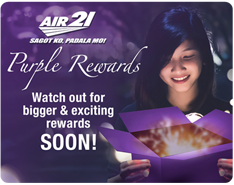 Customer has the option to collect the package at the nearest Air21 station. This means that the shipments should be held at the Air21 station and not delivered. Multiple Package Shipments consist of individual packages with varied sizes, weight, dimensions, and declared value but can be under one waybill if the shipments are destined to a single address. It provides structural framing support for moderately sensitive shipments. Shipments determined to be out-of-delivery areas and will require Air21 provincial agents to handle delivery. Charging is based on distance from the origin station to the area of destination. 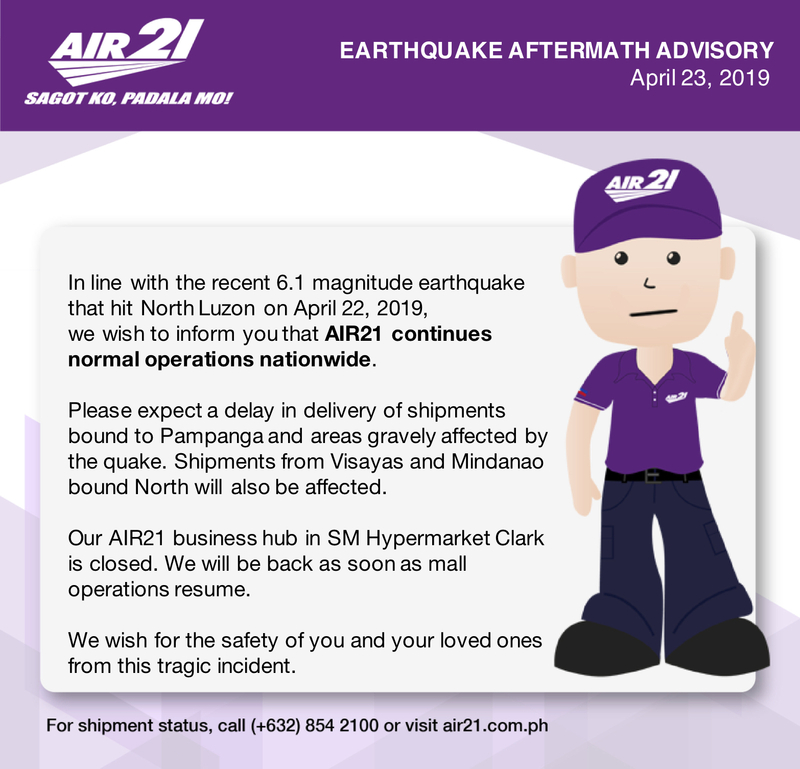 Shipments determined to be out of pick-up areas and will require Air21 provincial agents to handle pick-up of the shipment. This may have a prior arrangement with Air21 Customer Service. Charging is based on distance from the origin station to the area of destination. The place where the shipment originated. The shipper delivers the cargo to the forwarder's origin office and the Domestic Operations Agent delivers it at the consignee's doorstep. The shipper delivers the cargo to the forwarder's origin office and advises the consignee of cargo details and arrival. The consignee then picks-up the cargo at the forwarder's destination office. The shipper is the person or company who sends the package. It is the additional amount charged for the service given. Used in place of a paper airwaybill, it contains all necessary shipping information. The 12-digit number assigned to a shipment by Air21. The estimated time of travel between the point of origin to destination. The Value Added Tax (VAT) is added to the rest of the freight charges before the courier writes down the final or total freight charges to be paid by the customer. It is 12% of freight charges, declared value surcharge, and other applicable charges.